Houghton Mifflin Harcourt, 9780618091560, 320pp. "In his typically compelling style.....Murphy powerfully shows that the impulse to inquisition can quietly take root in any system—civil or religious—that orders our lives." "Entertaining, lively chronicle of the Inquisition, touching on a wide variety of issues across the centuries." 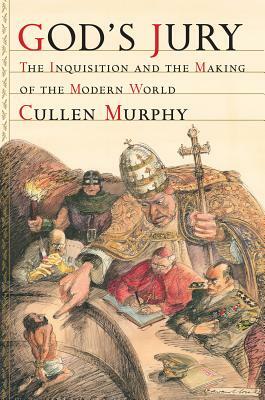 "Cullen Murphy's account of the Inquisition is a dark but riveting tale, told with luminous grace. The Inquisition, he shows us, represents more than a historical episode of religious persecution. The drive to root out heresy and sin, once and for all, is emblematic of the modern age and a persisting danger in our time." --Michael J. Sandel, author of Justice: What's the Right Thing to Do? "From Torquemada to Guantanamo and beyond, Cullen Murphy finds the 'inquisorial Impulse' alive, and only too well, in our world. His engaging romp through the secret Vatican archives shows that the distance between the Dark Ages and Modernity is shockingly short. Who knew that reading about torture could be so entertaining?" --Jane Mayer, author of The Dark Side. "God's Jury is a reminder, and we need to be constantly reminded, that the most dangerous people in the world are the righteous, and when they wield real power, look out. At once global and chillingly intimate in its reach, the Inquisition turns out to have been both more and less awful than we thought. Murphy wears his erudition lightly, writes with quiet wit, and has a delightful way of seeing the past in the present." "When virtue arms itself - beware! Lucid, scholarly, elegantly told, God’s Jury is as gripping as it is important." "There will never be a finer example of erudition, worn lightly and wittily, than this book. As he did in Are We Rome?, Cullen Murphy manages to instruct, surprise, charm, and amuse in his history of ancient matters deftly connected to the present." "The Inquisition is a dark mark in the history of the Catholic Church. But it was not the first inquisition nor the last as Cullen Murphy shows in this far-ranging, informed, and (dare one say?) witty account of its reach down to our own time in worldly affairs more than ecclesiastical ones."